Leaving behind the [overpriced] d’Oka National Park and continuing once more along Route Verte 1, we quickly found ourselves entering Kanehsatake- a Mohawk settlement along the shore of the Ottawa River in southwest Quebec with a strong sense of history and evidence of the immersion of the native language in schools and local businesses. What struck us most, however, was our entry and ride along ‘tobacco alley’- where the sides of the highway were lined with countless fishing shacks with huge signs and flashing lights advertising their wares- tobacco, in spite of the political and health issues associated with it, is sold tax-free is this region and as such, does a roaring trade that forms the foundation of its economic prosperity. There must have been 50+ of these make-shift shacks: some huge settlements with garish signs and flashing neon lights, others, tiny run-down looking homemade affairs with little more than a cardboard sign propped in the window. Defiant signs such as ‘We don’t collect taxes for no governments here!’ echoed the same message along the length of the road. In a day and age when tobacco advertising and sales are so controlled, it was literally unlike anything I had ever seen. Interesting, nonetheless! 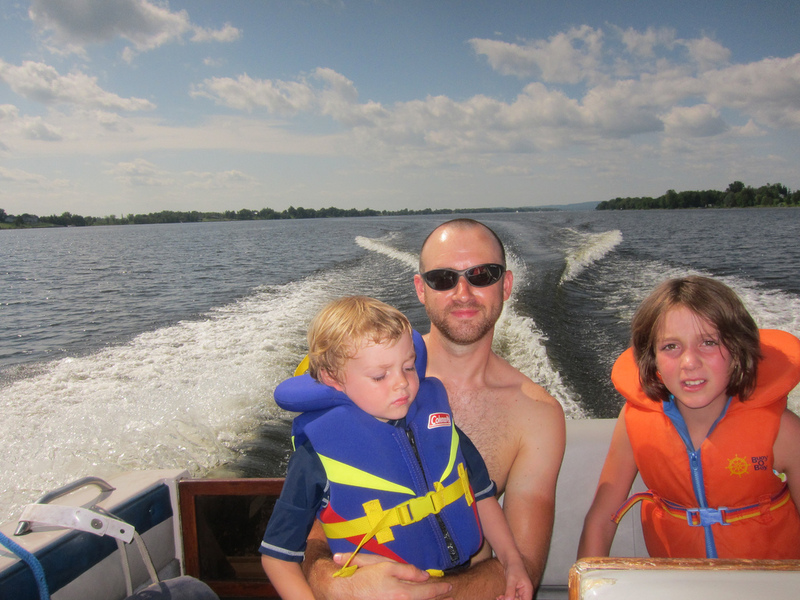 It wasn’t long before we left Route Verte behind and crossed the Ottawa River at Hawkesbury into Ontario. Actually, I felt a small sharp pang of sadness and realization the moment I saw the sign halfway across the river- this is the very last state we will enter. Since the beginning, we have entered and passed through 10 states in Canada and the US- starting in Alberta and crossing into British Columbia, entering the US in Washington and heading south through Oregon and then California, spending Independence Day in Nevada, flying across to Massachusetts, creeping slowly north through New Hampshire and Maine, re-entering Canada in Quebec and are now entering our 11th and final one. It’s an achievement- but also feels decidedly final! Our destination for the day was with some long-standing friends of our host Mimi in Montreal- Natalie and Pierre in Lefaivre, who had very kindly offered to put us up at their summer cottage along the river, in spite of their own family reunion plans in celebration of the long weekend and a few birthdays! It took us a while to finally find our way (googlemaps and TomTom couldn’t agree upon the actual destination- but that’s modern technology for you) but at last we pulled cautiously outside a house we suspected could be the correct destination, and had our suspicions confirmed once the garage door began to open and Pierre stepped out to greet us. In no time at all we were welcomed into the family, perched by the dock with beers in hand, awaiting the arrival of the rest of the family while Theo cautiously ventured to explore the water’s edge and the mosquitoes descended upon us in full force. Theo with his new ‘friends’! We had the perfect, relaxed evening- even as the temperatures continued to rise and the humidity became stifling and oppressive. Even the breeze coming off the water offered little respite- the air was in desperate need of a cool shower to shake off its sticky exterior, but it seemed the warm weather was determined to stay. The following morning saw us planning a short stretch to Rockland, and after a night of tossing and turning in the heat, Matt pleaded not to be forced to endure a night in the tent in such conditions- our tent being so small and hot in any case, let alone in such high levels of humidity. After a late awakening (surprisingly enough, on Matt’s behalf and not mine…) we begun googling for options as to where we could stay that night- seeking out motels, hotels, B&Bs, warmshowers and couchsurfing hosts. The prognosis wasn’t good. We had become so accustomed to passing through densely populated areas with a wide spectrum of choice in terms of accommodation that it hadn’t even occurred to us that this wouldn’t necessarily continue to be the case upon leaving Montreal. Our search brought up a single hotel in Rockland, no hosts, and the odd B&B either extremely close (requiring a very long ride the following day) and too far away (especially given the heat, which was already pounding down upon us with serious intent). I cursed, not for the first time, our poor organizational skills and lack of forward-thinking- and perhaps arrogance in assuming ‘something’ would work out for us. Even campgrounds, if we were to try and endure the heat of our tent, seemed to be conspicuous by their absence in this area- not, it would seem, a particularly tourist-orientated holidaying destination. We could try to cycle the 45-50miles to Orleans, stealth camp, or try the single (expensive) hotel in Rockland. A phone call to said hotel settled that final one for us- fully booked. Of course. It’s the Labor Day weekend- why hadn’t we thought ahead about this?! In the end, it was our amazing hosts who came to the rescue and offered to extend their hospitality for a further night, inviting us to join their family celebrations for the day. Cap in hand, I gratefully accepted- the prospect of stealth camping or cycling 40+ miles in the heat just seemed unbearable in such temperatures. I couldn’t thank Pierre and Natalie enough for rescuing us- especially given that we were intruding upon a family celebration in such a way, after they had taken us in with very little notice at the request of a friend! What followed was truly an amazing day. Lunch outside for 13: a big feat! After lunch (for 13 people- no small feat!) it was agreed that we would all be hopping aboard Pierre’s boat and heading 20minutes or so along the river in order to go swimming and enjoy the afternoon by the coolness of the water, in a bid to escape the stifling heat. This was easier said than done in our case. Theo was absolutely insistent that he would not go anywhere near the boat- terror about the noise of the engine and fear of the water combined to reduce him to a state of near-hysteria as we tried to coax him aboard, even as he watched his ‘friends’ climb on happily and beckon him excitedly to follow. We tried bribery and blackmail, reason and humour, all to no avail. Finally, I sat down on the trampoline with Theo and got him to look at me. I thought on this for a few moments. I decided a white lie was probably the best port of call here. To my immense surprise, Theo nodded solemnly and allowed me to arm him with life jacket, hat, swimming shorts and suncream before picking him up and walking towards the dock. Admittedly he begun to protest once we got within reaching distance of the boat (but hey, Rome wasn’t built in a day, right?!) but after a minor struggle, we got him sat on the boat. And incredibly, he was decidedly placid and calm as soon as we had him sat down at the rear of the boat. A little uncertain, perhaps, but calm and quiet- even when waves lashed at the sides of the boat or passing boats caused us to rock uneasily. Perhaps something I said did actually sink in. It was wonderfully cool on the water and before long, we had pulled into a shallow bay and proceeded to sink, one by one, into the soothing cool waves that barely reached to the tops of my legs. As the girls began to display their acrobatics skills and the men joined in with a game of Frisbee, I tried to coax Theo into the water. It’s hard to know what to do in this situation. I don’t want to risk furthering my sons fears or phobias by a.) ‘baby-ing’ him and allowing him to shy away from everything that evokes a degree of fear in him or b.) forcing him to confront his fears and then creating terror-induced hysteria that will surely escalate into those much-feared childhood memories that will haunt him forever more (hence furthering those ill-placed fears and phobias even more). What to do? Everyone tried to coax him in turn, offering their arms and reassuring him in turn. He wouldn’t budge. I tried in vain to get him to sleep as I saw him yawn and rub his eyes in that tell-tale manner but of course, there was too much going on here, too much excitement! I wanted to swim. Desperately. Why wouldn’t he come in? Coaxing and pleading- nothing works! In the end, envious of everyone enjoying the cool relief of the water, I could take it no more. I slipped off the end of the boat with a sigh of contentment and against his protests, pulled Theo gently in after me. He wasn’t happy, by any stretch of the imagination. He tried to climb up on me to avoid his feet touching the water and cried in protest. I continued to gently reassure and soothe him, not forcing him any further, walking slowly through the water with him. Then began a comical game of transferring him between Matt and myself, slowly and gradually dunking him slightly lower in the water, encouraging him to splash and kick and swim- and although Theo continued to cry out and protest, he actually started to laugh alongside also. He was enjoying it, in spite of himself. It’s frustrating to think that only 6 weeks ago, Theo was confidently swimming on his own, holding onto a noodle for support, and showed no fear or care for the water at all. I don’t know where this new-found fear has come from- but quite simply, I can’t let it carry on forever more. Call us cruel parents… but I think we’ll have to continue to expose Theo to water over and over with gentle, slow encouragement and try, as sensitively as we can, to help him overcome this. I just feel as though swimming and water confidence is too important a skill to learn, in this day and age! Boy’n’beer: enjoying a cold beverage in the water! We had such an incredible afternoon: so relaxed, so easy. I couldn’t believe the ease and openness with which this family had welcomed us into their home and along on their weekend- Matt stood in the water sipping a beer with the other guys, Theo played hide-and-seek in the hull of the boat with the girls, while I sat chatting to the ladies as they sunbathed out front. It was beautiful weather, blissfully peaceful, and around us were dozens of other boats and fellow sun-worshippers, drinking, relaxing, listening to music, playing games and generally making the most of the long weekend. And the water was the perfect retreat from the humid, sticky heat: so cool, refreshing. Bliss. Eventually we resigned to the return back to the beach house- and found, once again, Theo to be perfectly placid and surprisingly calm for the ride- sat below deck with the girls- while I enjoyed the exhilaration of standing up into the wind and having the sea spray whip at my hair and face as we sped over the water. I loved it- loved the smell of the sea, the feel of the boat powering forward, the slight heart lurch as we hit a wave and rocked unsteadily sideways, the small rush as you feel the boat move beneath you, adjusting your balance and riding with it. I just love being on the water- and truly hope and long to follow in the footsteps of those who have undertaken world ventures aboard their boats. After all, after a tiny tent and two bikes? Even a small boat feels like a mansion. Close your eyes and feel the wind..
That evening, we enjoyed another delicious meal with the whole family, with the wine and conversation flowing freely before the birthday cakes found their way onto the table and I successfully overdosed on chocolate sponge (mmm…) and managed to put an exhausted Theo to bed. After that, we retired outside- where the air, at last, was decidedly cooler and the mosquitoes had decided to leave us in peace for a night. Perched in a circle around the open fire, we watched a lovely show performed by the girls (admittedly I only managed to catch small pieces of it, given that it was in French…) before proceeding to toast the biggest (!!!) marshmallows I believe I have ever seen on huge toasting forks over the fire. There is something truly magical about gooey, chewy yet crispy-on-the-outside marshmallows, with that slight hint of smoky wood-fire ‘ness’ taste that just makes me feel so utterly content and blessed out- delicious. I had the most incredible evening, speaking mostly to Natalie- covering everything from the price of meat to politics and travel, dreams and ambitions to star signs and relationships!- but also dipping into the numerous conversations going on around us. I just felt… at home. And I realized, with a sudden pang, that I was actually experiencing a glimmer of homesickness- wishing I could be sharing moments like this with our family back home. Remembering the madness of the Johnson family BBQs and camping trips (Matt’s mum’s side of the family…) and the many parties and family gatherings on my side. On a family holiday like this- it made me miss home. We went to sleep that night slightly merry from the wine and beers, completely stuffed full of food, and invigorated and cheered by the company and conversation. It was completely perfect. The following morning, Natalie and Pierre were kind enough to offer us the use of their home in Orleans as our next ‘stop’- and we were incredibly lucky to have Natalie’s eldest son actually driving that way for work- and offer to take our bags in the car with him also! A day without the panniers? Oooh yes, please. ‘Cheating’: Our bags are set to go ahead of us! A horrific storm opened the heavens on us first thing before setting off, and for a while we were considering taking up Pierre’s offer to chuck the bikes on the back of the truck and driving to Orleans instead. However, in spite of the many quibbles and hiccups cycling has thrown our way since this trip began, I retain a strong passion for it- and even just one day off finds me longing to take to the saddle once more. We hovered around, waiting for the storm to pass, before beginning the ritual of the goodbyes. It was another one of those: we had shared the most incredible weekend with a family who had previously known nothing of us: who had opened their home to us and treated us like members of the family, had fed and watered us, helped us plan our route, shared their holiday and birthdays, and given us some incredible experiences. How on earth do you even begin to translate that into a ‘goodbye’? In spite of the many experiences I’ve had of undergoing this exact moment with other families previously, I have yet to find an answer- and remain frustratingly awkward, almost uncomfortable when the moment comes. There’s so much I want to say- and I simply have no idea how. Simple hugs and light-hearted goodbyes it is- insufficient, but it’s all we can offer. Cycling away at last, I felt a little sad. It’s unbelievable to think that we may never see any of these people again- sometimes, I simply can’t get my head around the fact. I only hope some of these amazing people we’ve had the privilege to meet on our travels do us the honor of coming to stay with us back in the UK some day! Thank you, Natalie, Pierre and family, for the most incredible Labor Day weekend!